Physical fitness goes hand in hand with Nutrition. The body will function properly only when it remains well exercised as well as well-fed! 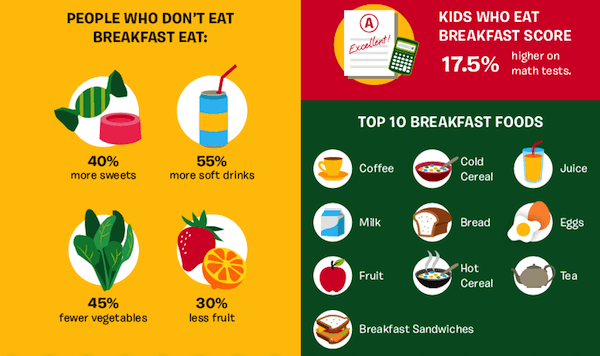 We already know the benefits of having a proper breakfast. Despite that, the morning rush always wins over us and we either end up skipping the breakfast or have an inadequate one! 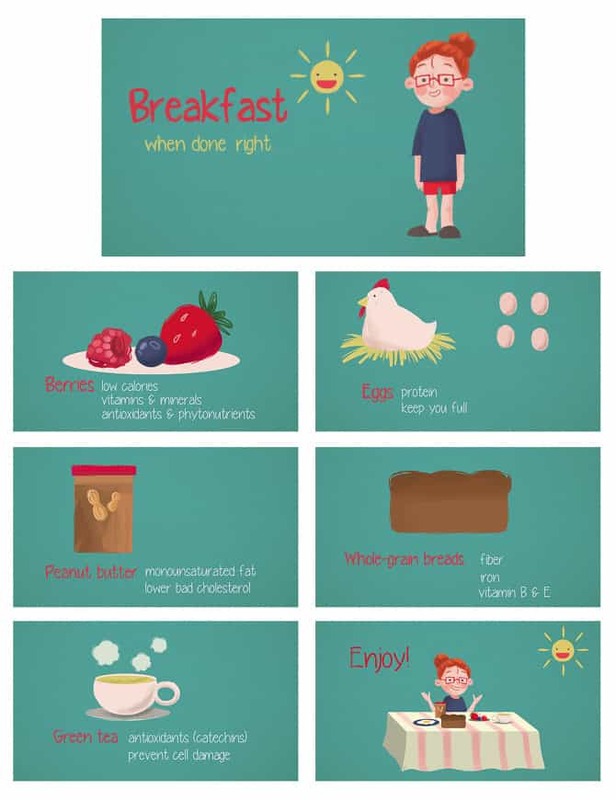 Here are some suggestions that may help you plan your daily breakfast and pack-in the right combination of nutrition, despite the rush! When you break your fast after eight hours of fast overnight, it becomes important that you load it with the right nutrients to get your body get into action for the day. Read more about tips on how to manage and squeeze in a healthy breakfast despite the rush in our blog post BREAK YOUR FAST, by clicking here. Eggs (any form as per taste), milk and few mixed nuts. Parathas (with sprouts and a vegetable added). Vegetable Upma with sprout chat and buttermilk. So make sure you plan well and break your fast every morning with an energy boost ! Contributed by Dt. Priya Karkera. Priya is a trained Nutrition and diet Expert. She works extensively with children as well as adults in the area of nutrition. She can be caught smiling anytime, with her very practical tips to a healthy diet, for the normal as well as the diseased. She has been a regular contributor to the Times of India simplifying the tricks of nutrition. Are our knees paying the price of Obesity? According to the World Health Organization (WHO), obesity is one of the most common, yet among the most neglected, public health problems in both developed and developing countries . According to the WHO World Health Statistics Report 2012, globally one in six adults are obese and nearly 2.8 million individuals die each year due to overweight or obesity. Due to the increased risk of morbidity and mortality, obesity is now being recognized as a disease in its own right. Additionally, obesity is strongly associated with other metabolic disorders including diabetes, hypertension, muscular problems, dyslipidaemia, cardiovascular disease and even some cancers. The risk for these disorders appears to start from a body mass index (BMI) of about 21 kg/m. Obesity is generally classified as generalized obesity (GO) and abdominal obesity (AO). Individuals with obesity have higher rates of mortality and morbidity compared to non obese individuals. India, with 1.2 billion people is the second most populous country in the world and is currently experiencing rapid epidemiological transition. Undernutrition due to poverty which dominated in the past is being rapidly replaced by obesity associated with affluence. Obesity is much more than a cosmetic problem, as its associated health problems is increasing. Despite the multifactorial nature of musculoskeletal disease, obesity consistently emerges as a key and potentially modifiable risk factor in the onset and progression of musculoskeletal conditions of the hip, knee, ankle, foot and shoulder. A recent World Health Organization report on the global burden of disease indicates that knee OA is likely to become the fourth most important cause of disability in women, and the eighth most important cause in men. It suggests that primary prevention of knee OA should become a major aim of health care. Several investigations of risk factors for knee OA have been reported previously. Most common important risk factors include obesity, previous knee injury, selected physical activities, the presence of hand OA, and a family history of the disease. Under normal conditions, articular cartilage provides a near frictionless surface, aiding in the distribution of pressure loads within the joint. OA has a logical link to obesity: The more weight that’s on a joint, the more stressed the joint becomes, and the more likely it will wear down and be damaged. Weight plays an important role in joint stress, so when people are very overweight, it puts stress on their joints, especially their weight-bearing joints, like the knees and the hips. In OA, there is an imbalance of the anabolic and catabolic processes of the chondrocytes(cells which protect the surface of the joints), leading to damage of the structural and functional integrity of the cartilage and adjacent bone and other joint tissues. Excess weight has been identified as an important risk factor for OA of the knee. Obese individuals have 1.5-2 times the risk of developing knee OA than their leaner counterparts. While the link between excess weight and higher risk of knee OA is well accepted, the mechanism of association is debated. Carrying extra body fat may also lead to the releases of a hormone called leptin, which some experts think may play a role in the development of osteoarthritis. In addition, body fat can release substances that promote inflammation in your body. 1.Get a consultation.If you have knee pain, discuss types of activities with your physiotherapist that might be safe for you. 2. Exercise. Those who think they have no time for bodily exercise will sooner or later have to find time for illness. Good types of exercises for heavier people include walking – even for just a few minutes when you’re starting out – bicycling indoors or outside, and strength training to build stronger muscles under the supervision of the physiotherapist. 3. Diet modification.Plays an important role in reducing and achieving healthy lifestyle, thereby reducing the load on the knees. The “stoplight diet,” can be followed one does not forbid any foods but instead stresses an appropriate balance of high-, medium-, and low-calorie foods. In this diet, “green light” foods contain 20 fewer calories per average serving than standard food in that group, “yellow light” foods contain not > 20 calories above the standard for food in that group, and “red light” foods contain > 20 calories above the standard for food in that group and should be eaten infrequently. As obesity and musculoskeletal problems are linked to each other, one must pay attention to their muscular flexibility, strength and weight parameters for longer healthy functioning of their knees. The fitter the body the better the life. So appropriate weight and healthy knees go hand in hand.